I'm not going to make an "Oh my" joke and you can't make me! Especially because the lion, tiger, and bear in this story are named after characters from The Jungle Book and not The Wizard Of Oz. 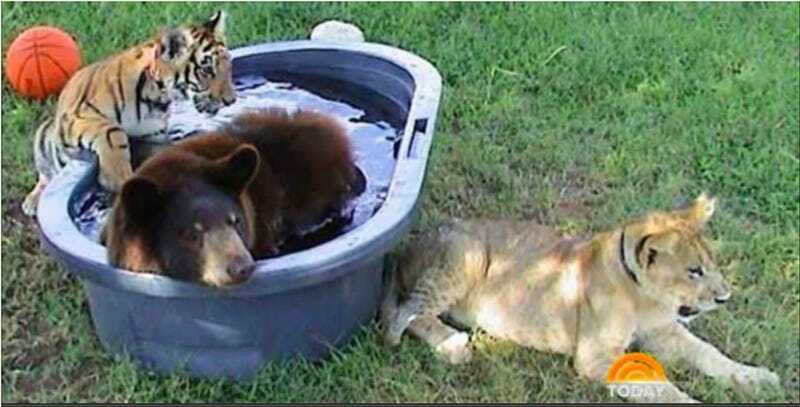 Cute sayings aside, this story of three unlikely friends is pretty amazing. Baloo, Shere Kahn, and Leo (collectively known as BLT and soon to release a bestselling album) all live on Noah's Ark Sanctuary in Georgia and have no idea that they wouldn't have ever met under any other circumstances. The trio were saved 13 years ago from horrid conditions at the home of a drug dealer and now live together in perfect harmny in their own enclosure. According to their keepers, they not only get along, they seek out each other's affection and, if the photos are any indication they also swim and nap together all the time. I bet their slumber parties are amazing.